My Orange Brompton: I Finally Get New Grips for my Titanium Orange Brompton! I Finally Get New Grips for my Titanium Orange Brompton! One upgrade I have not bothered with until now all the time I have owned my various Brompton bikes has been the grips. Many deride the stock Brompton foam grips supplied with the bike but I have not really had too much of a problem with them. After last Saturdays ride from London to Whitstable and then cycling home thereafter brought my decision to finally upgrade the grips to the forefront on my mind. I didn't suffer too many ill effects but the palms of my hands did have a few mild aches so I thought I'd take the plunge. As far as grips are concerned many of my fellow Bromptonains opt for those made by Ergon. Having seen them in action on many a ride and liking what I saw and heard I ordered some. I went for the GS1-L with the 'L' standing for light. The grips are a little over 100g but the the comfort they offer makes them a welcome addition. They are very comfortable and instantly you feel that your hand is better supported, in a way the stock grips are unable to compete with. I also like the fact that this particular version apart from being lighter than the standard Ergon's they are all black. Fitting them was a fairly straightforward affair but I did need to cut the end of the grips so that they would fit. This wasn't too bad but I up have covered the sins of slight uneven cuts with black tape which actually makes things rather neat and tidy. The grips have bolts on the end which when tightened do keep he grips perfectly in place. 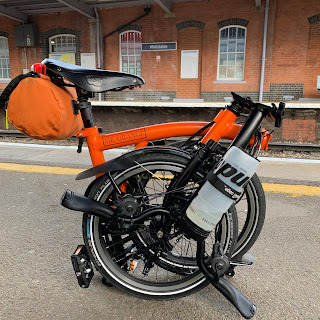 Now that I have taken the plunge I will almost certainly order another pair of Ergon grips for my Original Orange Brompton. In many ways I don't know why I didn't do this sooner? I have had a thing about keeping things as original as possible but of late I have been seduced by the Dark Side and gone upgrade mad. I was looking forward to using these grips with their extra comfort on the 120 mile Dunwich Dynamo this Saturday but I am now all but certain I will not be able to go unfortunately. After Saturdays 80+ mile ride to Whitstable - the first big ride using clipped in pedals - I have been suffering from a rather tender left knee. Strangely the day after the ride I felt totally fine with this tenderness making itself known on Monday. I have not been on the bike all week and even today it is still there. Yes you're right. They are billed as the lightweight version. I wonder what the standard ones weigh? 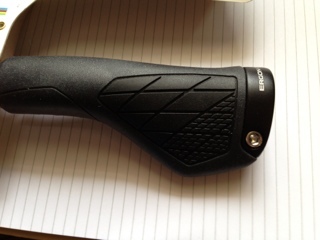 The GS Leichtbau grips are the lightweight "Racing" versions of the GP line which Ergon calls "Performance Comfort". 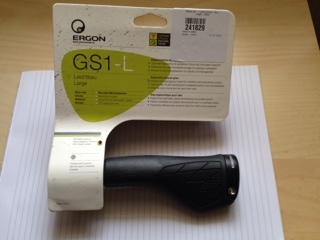 The L in GS1-L stands for large- there is also a GS1-S which is the smaller-sized version of the same grip. According to Ergon, your GS1-L grips weigh 155 grams a pair, and the end caps weigh 5 grams a pair for a total of 160 grams. To answer your question, the non-lightweight version of your grips, the GP1-L, weigh 202 grams a pair; end caps are 5 grams a pair for a total of 207 grams.